Forms, or patterns, are a choreographed set of blocks and strikes, performed as if the martial artist was defending themselves against multiple attackers. The moves within the forms have been practiced for centuries, refined and perfected by countless generations of martial artists. They serve as a touchstone to our past, and provide a consistent baseline for future martial artists. Practiced regularly – and correctly – the forms teach a martial artist the movement and balance needed for an instinctive response to a threat. At Koryo Do, new students learn, and must demonstrate, the form for their level as they move up through the colored belts. As students become more advanced, they must demonstrate a deeper understanding of the moves that are done within the forms, and a comprehension of the definitions behind each form. 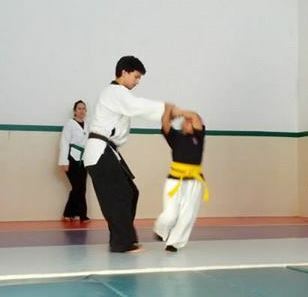 If you are from a different Tae Kwon Do school and wish to use the Koryo Do forms for reference, please note that while our forms are based on ITF patterns, they have been customized for Koryo Do’s unique style. You are welcome to print these forms for your own personal use, but they may be a little different from the patterns taught at your school. Lesson plans include the Kicks, Hand Techniques, Self Defense Moves, One Steps (a practice response to a punch), and additional items for each level. Koryo Do students: you can view and print your lesson plan by signing in, selecting your level from the left side menu, and clicking on the ‘lesson plan’ link.